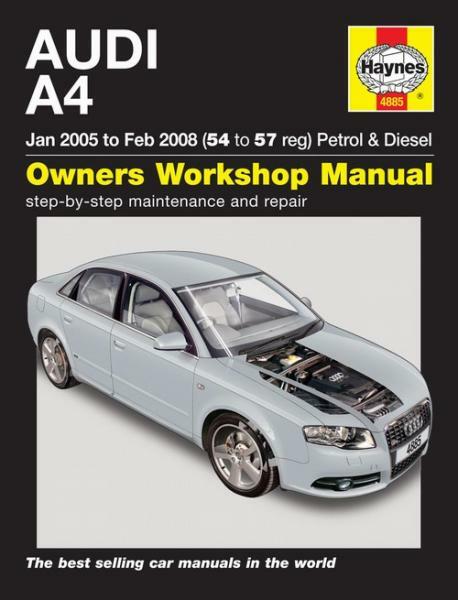 Haynes manual Audi A4 Petrol & Diesel (Jan 05 to Feb 08). Haynes Audi bil bok/ Owners Workshop car manual. Saloon and Estate (Avant) (model code B7) with 4-cylinder engines. Petrol: 1.8 litre (1781cc) and 2.0 litre (1984cc) 4-cyl, inc. turbo. Does NOT cover 1.6 litre or V6 or V8 engines. Turbo-diesel: 1.9 litre (1896cc) and 2.0 litre (1968cc) 4-cyl.